Jackson Hole Brian and Russian Alex showed us Koko Crater was working today, so Don and I hiked up there with Sand City Wade to try it for ourselves. Utah Dell found his way up to launch and joined us. Conditions were on the strong side at first, but gradually subsided to an incredibly smooth pleasant breeze, and we were treated to spectacular views as the sun sank over Diamond Head. Near the end of the afternoon, someone launched an Advance wing and sank out, followed by Frank who launched last and scratched a while for the late session. The wind shut down completely just as Fireman Dave hiked up. I also heard Jetflap and Russell on the radio hiking the lighthouse trail, and Bob checked in on his way to mow the lawn at the new clubhouse. I saw Czech Peter laying low at his van across the park, and I ran into Canadians Rick and Paul, and California visitor Loyal at Sandys after landing. 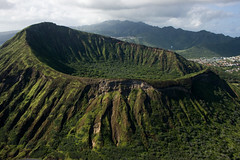 What a sweet, busy day at Koko Crater! I also heard that Doug soared the ridge above Kalaheo High School near his house. Way to go Sand City Wade! I didn't know you were going to Hawaii. I'm jealous! Alex, I don't know if you remember me from this past August, we hiked up, then down, at Kahana. It was gusty from the hurricane so we didn't fly. Anyway, just taking the opportunity to say hi. I still read your website and chattebox almost daily, and get a vicarious thrill from the awesome pictures and stories. Sorry to get your hopes up Rich! It's still just a fantasy for us to have our own swank pad like the HTMC. I was sort of making fun of Bob's recent adventure in homeownership - he got a teardown in Kalama Valley right there across from Koko Crater, and he was there mowing his new lawn yesterday - the house is falling apart though and won't be there in about week or two. Dave Z from Apple, I sure do remember you, and your little phone too. I broke down and got myself one, I couldn't stand it, and my wife too. Come back and fly with us sometime. Alex- I'll definitely be back to fly there soon. I enjoyed your "rubber helicopter blade" pics too. I've gotten similar results with the phone camera from my motorcycle. And if you like the phone now, you're really gonna like it in a few days. Cheers.